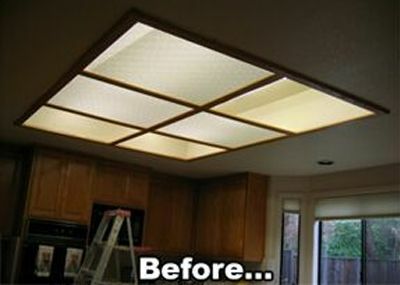 One of our specialties is kitchen panel light upgrades. Back in the day, many homes were built with a similar kitchen lighting. The kitchen would have a recessed box built into the ceiling, fluorescent (tube) lights were installed inside the recessed box, and the opening to the ceiling recessed was closed using a metal framed along with translucent plastic tiles. These have become long outdated! 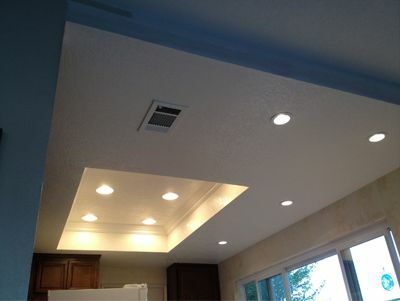 Our team can remove all of the old lighting and décor and then make your kitchen ceiling look updated. We will refinish the inside of the recess and leave it open to make your kitchen ceiling feel higher and your kitchen feel bigger. We then install recessed lights throughout the kitchen to give your most important workspace the light you need. We often add in accent lighting such as the pendant lights you see hanging in the banner photo above.